When Astronomer Pieter van Dokkum was looking for ways to study galaxies, he turned to the equipment he was familiar with as an amateur photographer. Thanks in part to some advanced optical coatings, he and his research team have been able to discover previously unseen galaxies. In 2011, van Dokkum and fellow professor and astronomer Roberto Abraham, were discussing ways to find a way to get a better look into the very diffuse cosmic light that’s scattered by traditional telescopes like Hubble. Van Dokkum’s thoughts turned to his consumer imaging equipment, and some claims Canon was making about its then-recently-released 400mm F2.8L II. Introduced in August the previous year, the 400mm F2.8L II offers what Canon calls ‘a SubWavelength Structure Coating (SWC), which uses microscopic cone-shaped structures smaller than a wavelength of visible light’ to reduce internal reflections and scattered light. This kind of coating would theoretically help collect enough light to study galaxies with low ‘surface brightness’, and sure enough, it did. Says van Dokkum: ‘We compared their performance to those of the best reflecting telescopes, and found that they produce almost an order of magnitude better suppression of the wings of the point spread function – probably in part because of the SWC coatings.’ In short, the 400mm F2.8L II fitted the bill. 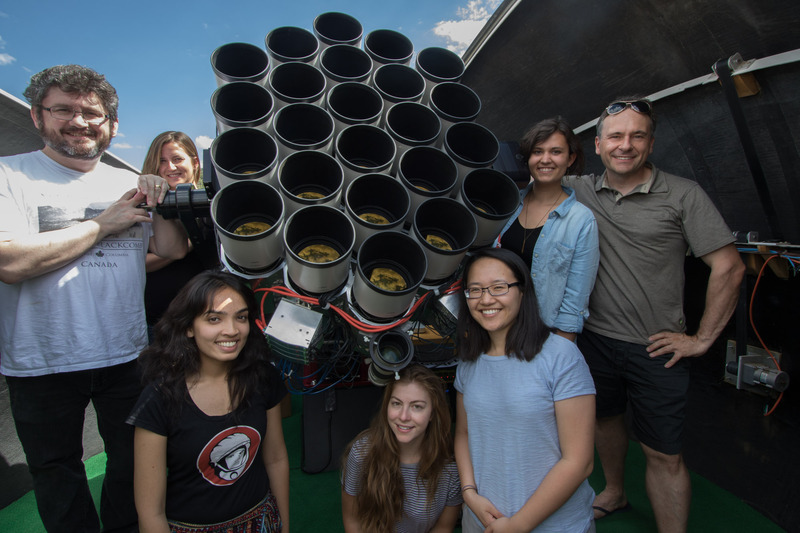 More lenses were acquired and the Dragonfly Telephoto Array was born (clustering lenses allows researchers to increase the effective aperture of the system). Van Dokkum and Abraham started with eight lenses, and now operate two mounts with a total of 48 lenses. You won’t find a Canon EOS 5DSR behind anywhere on the array, though. 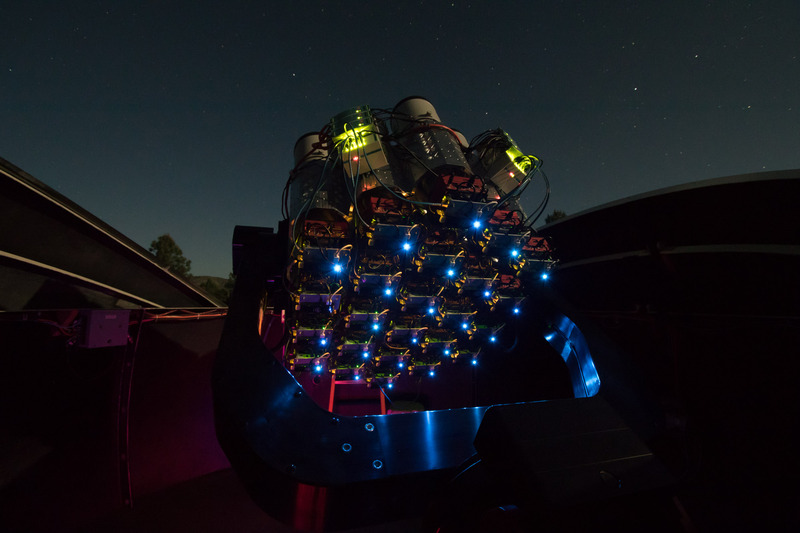 Each lens is attached to its own science-grade 8MP CCD camera, and has a custom astronomical filter slotted in. There’s a custom-built connector between each camera and the lens that can drive focus, and an Intel Compute Stick attached to each camera takes care of data recording and some processing. It’s all controlled by a central computer that can carry out commands like ‘auto-observe Mars’ and ‘expose 900 seconds’. 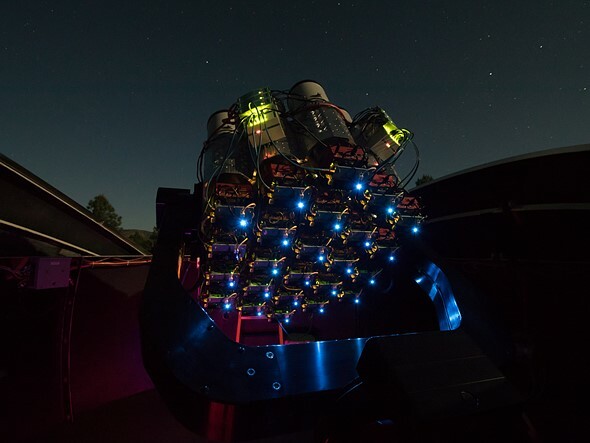 The array has helped examine much-observed heavenly bodies like the Coma Cluster, where they’ve been able to identify what the research team has dubbed ‘ultradiffuse galaxies.’ They continue to discover more of these galaxies with the help of Dragonfly, and aim to keep learning about their variety and formation.